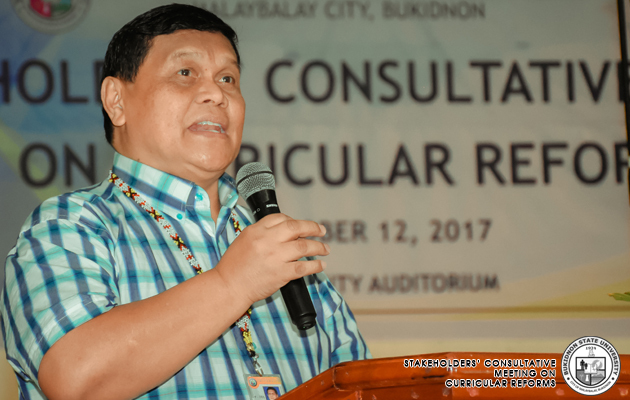 Bukidnon State University’s quest for excellence continues as it holds its Stakeholders’ Consultative Meeting last October 12, 2017, Thursday from 8:00 in the morning to 5:00 in the afternoon at the university auditorium. The meeting was participated by the BukSU administration headed by the University President, Dr. Oscar B. Cabañelez; the Vice President for Academic Affairs, Dr. Estela C. Itaas; the Deans of the six colleges; and the stakeholders. The consultative meeting was held to present the different programs offered in the university to the stakeholders and to get their overall perceptions on each of these in terms of its relevance, expected competencies of the graduates, and their suggestions for the improvement of the program. Both the internal and external actively shared their inputs during the said meeting. The result of this meeting will be used to improve the programs offered in the University for the greater satisfaction of the stakeholders.